Richie Venton: STAND UP - PAY UP - DEFY TORY AUSTERITY! STAND UP - PAY UP - DEFY TORY AUSTERITY! Christmas is supposed to be the season of goodwill towards all. Not so when it's the season of budget-setting at Scottish and local government levels. With the knives being sharpened and wielded, far from being a source of good cheer, it threatens ill-will towards public service workers, and wilful damage to public services - including life-and-death services for children and elderly people. Most of us are already long-since convinced that the obnoxious Tories are the chief axe-swingers, with a callous record of killing people through health and safety cutbacks, benefits sanctions and decimation of lifeline services. Their claims that austerity is ended fools nobody living on below-breadline benefits, the derisory minimum wage, or stressed into a state of mental illness from insecurity in their job. Nor do the Tory soothsayers convince elderly frail people subjected to mere flying 15-minute visits from overstretched care workers; or teachers and students crammed into overcrowded classes; or people absolutely desperate for a home, who confront the slaughter of decent social sector housing. Things are supposed to be different in Scotland. Millions voted for candidates declaring their undying opposition to Tory austerity, particularly in the 2017 general election. That was the central feature of Jeremy Corbyn's improved performance for Labour; his pledge to ditch austerity. That was pivotal to the SNP's appeal to voters, with their 2017 Manifesto declaring "we will roll back the impact of Tory austerity". But words are cheap, and they don't put food on the table. Governments and parties will be judged - harshly - by what they do when they are handed the reins of office by voters, as opposed to any ringing declamations in glossy election manifestos. And growing tens of thousands of Scottish workers are judging those holding office in Holyrood and the town halls as Ebenezer Scrooges on pay and conditions, rather than being seen as bountiful Santa Clauses. That's why a vast - and potentially very powerful - army of workers are marching, meeting, lobbying, protesting and voting for strike action, particularly on pay. Millions of workers have suffered over a decade of pay cuts, in both the public and private sectors. It's been officially declared the longest period of real pay cuts since the Napoleonic Wars, 200 years ago. Plunging wages have choked off spending power and added to the horrendous epidemic of job insecurity, with workplace stress and mental ill health spreading like a modern plague. In the recent survey of 10,500 members of my own union, Usdaw, we discovered 63% feel worse off compared to five years ago, with a shocking 76% of them relying on pay day loans, credit cards and overdrafts to pay everyday, essential bills. As well as two-thirds of these workers - employed in the second-largest sector of the entire economy - saying financial worries are damaging their mental health, a full 10% of retail workers who put food on the shelves are unable to put food on their family's table, resorting to food banks over the past year! Unison Scotland surveyed 2,000 Scottish union members last June. The picture that emerged is a bleak condemnation of the politicians who promised to end or roll back Tory austerity. A full 74% of these public service workers have witnessed job cuts in their department, leading to 52% feeling their workload is unmanageable, and 57% of them regularly working unpaid overtime to try and catch up in the provision of services to often vulnerable people. Their horror stories of overcrowded, mouldy housing; increased rat infestation; and vulnerable children and adults not getting the services they desperately need, led to 78% of council workers having no confidence in the future of local services. And exactly half of them are thinking of leaving their council job for something less stressful elsewhere; good luck to them in finding that, we have to add. Such dire conditions of insecurity, falling incomes and unprecedented stress and anxiety can fuel one of two types of response. Utter despair and resignation (and for some, openness to right-wing demagogues who blame immigrants). Or an angry, well-directed collective revolt through trade union and political struggles, to put the blame squarely where it belongs, the profiteers and their political representatives, with a rational alternative based on putting people before profit. The potential for the positive, latter course of action is to be seen in a rash of recent outpourings against pay cuts, unequal pay for women workers, and demands for proper funding of local services. 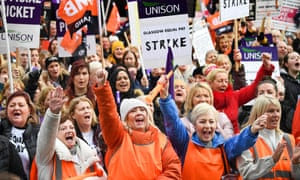 Over 8,000 low-paid Glasgow city council workers, about 90% of them women, recently staged the biggest equal pay strike in the country's history. They are in revolt against a pay system which means they are £3-an-hour worse off than they should be under equal pay legislation - a criminal system in place since at least 2012, mostly under a Labour-run council, now under the SNP-run administration. This was an eruption of working-class anger and mass, collective power - not calls for equal places on company boardrooms by a handful of extremely privileged women. The power and vitality of the strike - driven from below by carers, caterers, cleaners and classroom assistants - has raised the sights and confidence of thousands of other workers, and put the SNP council on the run. So much so that a vocal section of ultra-loyal nationalists have insulted the intelligence of these workers by claiming they are mere puppets in a cunning Labour Party plot to discredit the SNP council and SNP Scottish government. They should try telling that to one of the mass meetings of women, who are seething at being treated as second-class citizens for years, furious that far too many of them have died before getting the equal pay and back-pay compensation that was rightfully theirs. Of course the hypocrisy of Labour on this issue stinks to the high heavens. Up until 2017, it was a Labour council which resisted union demands for equal pay - including during 10 different strikes against the council - and squandered over £2.5million of Council Taxpayers' money on court cases to overturn rulings in favour of equal pay. And they suppressed the findings of the Equality & Human Rights Commission in 2010, which found the Labour council guilty of discrimination. Equal pay will cost the council at least £500m, plus the ongoing increase in the wages bill when the necessary new pay structure is hammered out in talks with the unions, to banish pay inequality for the years and generations of workers ahead. But as union activists have rightly insisted, this must not be at the cost of pay cuts to other workers, nor even further cuts to services; it should be a case of equalizing upwards, with demands for adequate funding off the Scottish government. The 2016 SNP Manifesto declared: "The defining mission of this government will be education." Music to the ears of parents and teachers alike, after decades of cuts, rising class sizes, class-based inequality in attainment, and mind-breaking workloads for staff. But such melodious promises are turning into an ugly echo of Tony Blair's infamous mantra that his Labour government would prioritize 'Education, education, education', only to then slash the service. The same noisy handful who have accused Glasgow's equal pay strikers of being puppets worked by Labour Party plotters have likewise claimed the eruption of school teachers' demonstrations and ballots for their 10% pay claim is all a ploy to discredit the SNP government. 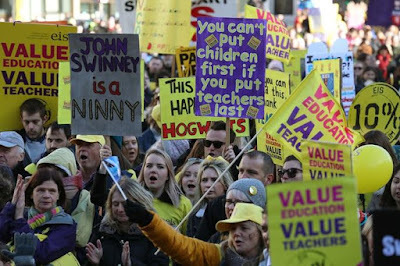 I doubt if even the most big-headed Labour MSPs or spin doctors could dream of having the power to pour out 30,000 teachers on their recent mass demo, with its combination of family carnival atmosphere and determination to turn the tide on pay cuts, work overload and recruitment crisis in many schools! It was an outpouring of years of teachers' frustration and angry rejection of the divisive 3% offer from COSLA and the SNP government. And far from being mere stooges of some Labour plot, it's a fair guess that a majority of the teachers on this 3-mile-long demo will have voted SNP in a recent election! No wonder they were dismayed at the letter jointly issued by COSLA bosses and SNP Cabinet Secretary John Swinney, designed to bypass the teachers' union representatives, in the vain hope of atomizing and browbeating individuals into surrender. 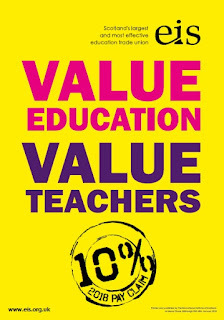 On the heels of the demo, EIS teachers voted by a landslide 98% majority, in a whopping 74% turnout, to reject the 3% offer, and look set to ballot for strike action in the New Year. Parallel to these high profile pay battles, local authority workers in the three unions - Unison, Unite and GMB - have rejected COSLA's 3% pay offer, and have started to vote for strike action. Simultaneously, lecturers in Scotland's further education colleges are voting for strike action in pursuit of a cost-of-living pay rise. 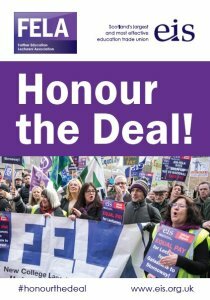 These members of EIS-FELA union are furious at college management only offering a 2.5% pay rise over three years - a pay cut, given inflation levels - with the added atrocity that the employers want to tie this offer to the pay increases won through strike action for pay equality across all the FE colleges two years ago, robbing back up to £1,000 from the rises won then. Combine - Make Them Pay Up! These combined workforces make up nearly 200,000 workers. The coming together of these separate strands of the same struggle - for decent pay that compensates a bit for inflation and years of pay cuts - should be an opportunity for coordinated campaign rallies and industrial action. The 'Pay Up' lobby of the Scottish parliament on Budget Day, 12th December, and similar localized events targeting council meetings, should be used by union leaderships to spell out a clear, bold alternative to the litany of annual cuts to pay, jobs and services. Given the slaughter of services, jobs and wages over the last decade and more, we actually need a crusade to reverse austerity cuts. But as an absolute bare minimum, unions should demand that the Scottish government and all 32 local councils set No Cuts budgets for 2019/20, incorporating the immediate pay claims and equal pay claims of the workers already taking action. And also including the minimum employment standards in their budgets of a £10-an-hour minimum wage and guaranteed minimum 16-hour week for all their staff and contract workers who want it - as unanimously demanded at our recent Scottish Usdaw conference, representing 45,000 members. Roll Back – or Roll Over? Some will plead that councillors or MSPs simply cannot take such a defiant stance, given the budget cuts handed down to them by Westminster. If that's the case, why make false election promises to "roll back the impact of Tory austerity"? Why not honestly declare "we will roll over in the face of Tory austerity"?! It's true that after all the huffing and puffing and claims to have ended austerity in their recent Budget, the Theresa May Tory government has only increased the block grant to Scotland by a minuscule 1.8%, to £30.5billion. But where's there's a political will there's a way! May's Tory government is in an unprecedented crisis. 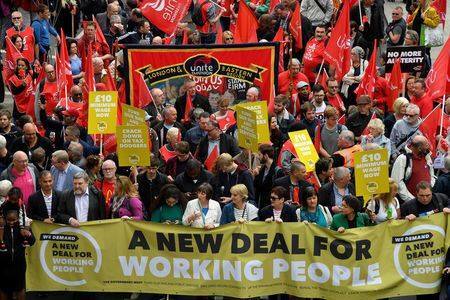 Surely the political leadership of Scotland, in collaboration with the leadership of about 200,000 trade unionists already poised for action - and those of over 600,000 organised trade unionists in Scotland as a whole - can turn the Tories' difficulties into our opportunity? By setting No Cuts budgets, and mobilising mass demonstrations and supporting any strike actions voted for in union ballots, the Scottish government and council leaderships could cudgel the besieged Tories with demands for extra funding to avoid all cuts and meet workers' demands. They could popularise the demand "Give us back some of our stolen £billions!" That's what a socialist council or government would do. Tax the rich – double the money! 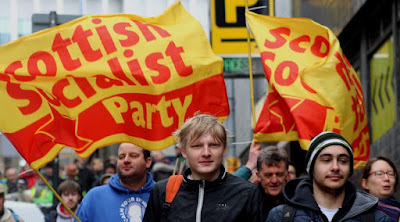 Furthermore, the SSP has for 20 years persistently advocated an immediate, straightforward, fully-researched alternative form of council funding which could shield Scotland from the atrocities of austerity. It's true that the majority (54%) of all council funding comes directly in a grant from the Scottish government. But 18% of all funding (last year) came from the Council Tax, and amounted to £2.24billion across Scotland. But the Council Tax is an unfair, regressive tax, that hammers the poorest and middle income families, and merely tickles the wallets of the rich with a feather. The SSP has fully costed our alternative, a Scottish Service Tax, based on income, on ability to pay, with rising tax bands. And the beauty of this progressive tax proposal is that about 80% of people would pay less, but by taxing the rich minority the funds raised would be double that coming from the regressive Council Tax; over £4billion a year instead of £2.24billion. So instead of hammering workers with higher Council Tax bills, or pay cuts, or job losses, or the slaughter of services... and in reality a cocktail of all these multiple attacks... the Scottish government has the full powers under devolution to stop all austerity, pass legislation to implement such a Scottish Service Tax, and shelter Scotland from the Westminster storm. And the additional £2billion raised would almost reverse the cuts of the past five years in one year alone! We approach 2019 with Scotland at a crossroads. We can sit down in surrender as the Tories at Westminster issue austerity, which the Holyrood government meekly devolves to local councils, health boards and college managements to implement, which in turn they do without a whimper. We can blithely pass by while SNP MSPs line up alongside Tory MSPs to block an end to the profiteering debacle of Dutch-owned Abellio ripping the profit out of ScotRail workers and ScotRail passengers - so that the same profiteers can two weeks later announce abolition of free travel for children. We can accept poverty pay, cheap casualised labour and a mental health epidemic with the plea "there's nothing we can do about until independence". Or we can seek to weld the several strands of struggle on pay and public services into a coordinated resistance movement, armed with a vision. The vision of an alternative system that taxes the rich; that demands well-paid, secure jobs, including a minimum wage of at least two-thirds average male earnings, and a guaranteed 16-hour minimum working week; that provides cradle-to-grave public services fit for the 21st century; that constructs a free, publicly-owned transport system that helps tackle poverty, pollution and provides decent jobs and apprenticeships at one fell swoop; a clean, green socialist Scotland that builds green energy technology instead of warships. The Scottish Socialist Party is determined and willing to stand up on our hind legs in resistance; to play our part in pursuit of these aims, in the workplaces, unions, colleges and streets. We appeal to fellow-workers to demand the same of their unions, and those who regard themselves as socialists in Labour or the SNP to demand nothing less of their own party leaderships. It's time to decide whose side they are on! Q: What has created such strength of feeling – the 98% vote to reject the 3%? 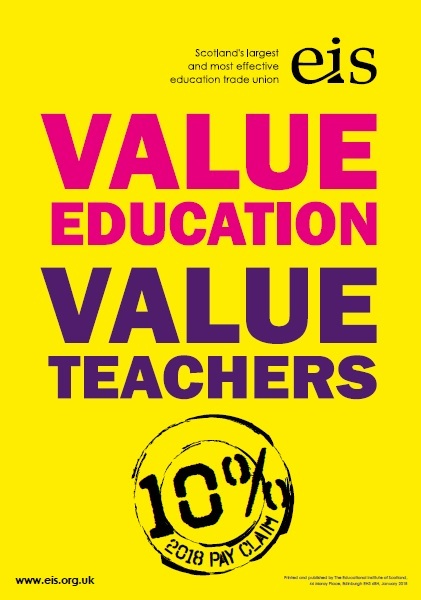 A: Teachers have reached the end of their tether like all workers in the public sector, working increasing hours through more changes in education, and in mitigating some of the worst poverty-related issues we have seen since the Thatcher and Major years with their time and money. The huge cuts in provision, our salaries, and the increased pressure of increased classroom sizes, really have pushed teachers to emotional limits. Q: What did you think of letter from COSLA and John Swinney? A: I think John Swinney and COSLA made huge errors in treating teachers as scabs. Swinney and the SNP won the elections after betrayals of workers by New Labour. Swinney should carefully reconsider his disregard of workers’ representatives and proper negotiation. Q: Why is 10% justified - when most workers get 2%? A: All workers should have confidence in fighting for what we are due. Tory austerity is completely ideological. It is a cover for the robbery of all workers. The millionaires and billionaires are becoming richer beyond most people's imaginations while workers are paying their gambling debts. Q: How will employers pay for it? Cut other services or jobs?? A: Simple. Raise taxes of the highest earners, and replace the dreadful council tax with a fair, Scotland wide, service tax. Q: What should the union do now to win the 10%? A: Industrial action, in my opinion, is the only way forward. A simple work to rule would be a start. Teachers in my school are working 50-60 hour weeks. Working 35 hours a week will expose the huge hole in funding we are plugging with our extremely stretched good will. Teachers really don't want to impact on already stretched working class families. But the increasing pressure on delivering a curriculum with less resources, fewer adults in schools and with ever decreasing free time, is pushing teachers towards industrial action that will see schools closed.